Skin-Support is our exclusive collagen supplement for skin nutrition that works to promote smooth, youthful looking skin, aiding with issues such as the appearance of spots, dryness, stretch marks, fine lines and wrinkles. It is comprised of two key ingredients. The first is Collactive™, our collagen supplement that is a special form of marine collagen and elastin polypeptides with the same ratios of collagen and elastin found in the dermis. The other gradient is a very special form of New Zealand grape seed extract. From the age of 25, your body depletes collagen at approximately 1.5% each year. By the time you reach 45, you will have lost 30% of your body’s collagen. Collactive™ is a clinically-proven, highly purified, non GMO form of collagen and elastin polypeptides that exist in the same ratio as found in the human dermis – a combination of predominantly type 1 collagen (85 to 90%) and type 3 collagen. These two main constituents of the extracellular matrix work together to reduce wrinkles. In addition to anti-wrinkle benefits, it also stimulates the lifting and toning of skin and increases skin moisture retention. Wild harvested extract of fish from the far north Atlantic is a pure, sustainable by-product of the fishing industry, using only the skin, not the scales. Collagen peptides have been shown to have the ability to increase hyaluronic acid production in the dermis and improve skin barrier function. The grape seed extract used in Skin-Support is made from the seeds of grapes harvested in New Zealand. These grapes have been shown in laboratory analysis to be higher in antioxidant potency than grapes from other parts of the world. This is due to their adapting to the higher radiation from the sun due to the ozone hole over the southern part of New Zealand. Added to this the extract is achieved by using a water extraction system that unlike other extraction methods keep all the natural active properties of the grape seed intact. As we get older, the matrix of collagen and elastin in the dermis is damaged by free radicals. As a result of this the matrix shrinks which results in the skin folding…thus creating wrinkles and a need for collagen support. To avoid this happening you must supplement the collagen and elastin matrix by ‘topping up’ these components, PLUS provide potent antioxidants to reduce the damage from free radicals. This is why we have added a potent antioxidant in the form of grape seed extract in addition to the collagen and elastin complex. Elastin is one of the most important proteins found in connective tissues and is an important part of the collagen and elastin matrix that makes up the dermis. It has a unique molecular structure and contains many hydrophobic amino acids such as glycine, alanine, proline, and valine. Unlike collagen, elastin plays a role of a flexible component in tissues and helps to give the skin suppleness. How does collagen help hair health? Our Skin Support collagen supplement not only supports youthful skin, but it also promotes healthier, thicker hair. Collagen supplement for hair are particularly essential for those experiencing hair loss as it helps to strengthen the hair, preventing breakage and reducing brittleness of the hair. Not all collagen supplements are the same! A large percentage of collagen supplements on the market are simple collagen derived from pigs and cows, sometimes sourced from questionable areas. These collagen supplements give no direct benefits as the molecular size is too great for the body to effectively assimilate.3 In addition they are not hydrolyzed which is essential if they are to provide any benefits. Always ensure that your collagen is hydrolyzed and, also is of fish origin which is more effective than the bovine or porcine options. Even among fish collagen supplements, there are variances. It is desirable that the collagen is extracted from the skin, NOT the scales as extracts from the scales require the use of chemicals to break them down. Most low price fish collagen supplements have been extracted from the scales of fish skin. Containing marine collagen formulated in the North of France and grape seed extract from New Zealand’s world renowned grapes, Skin-Support enhances the skin’s natural collagen and elastin matrix to visibly plump and reduce the appearance of fine lines and wrinkles. Does not contain gluten, soy, dairy or peanut. If desired, the dose can be doubled to 6 capsules a day. Can be taken at any time with or without food, throughout the day. Combines well with our Zupafood products and Omega 3. 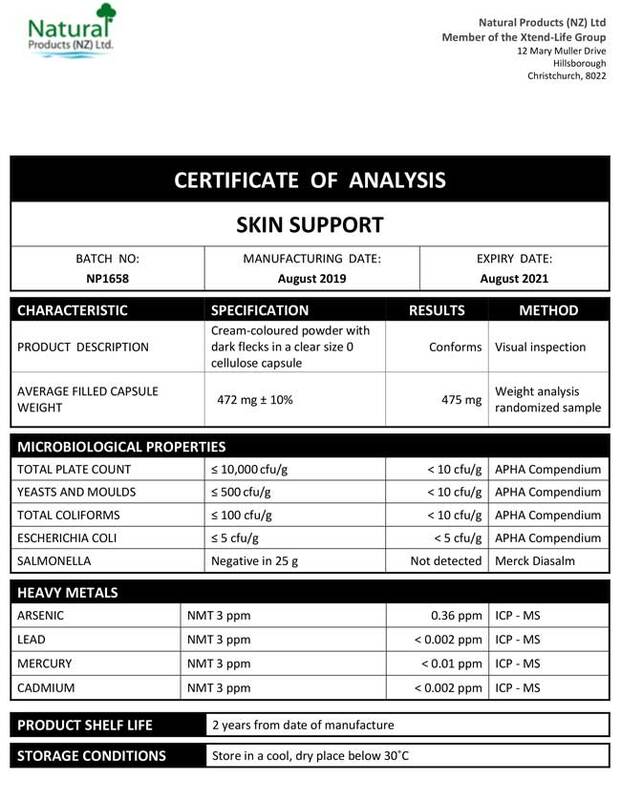 We have included below a copy of a typical Certificate of Analysis (CoA) for our Skin-Support product. You will note that there are two columns which are headed 'Specification' and 'Results' respectively. The specifications are simply our minimum standard to which each batch of Xtend-Life Skin-Support has to conform, otherwise we would not release it. The results are the actual results from the independent laboratory that did the testing. What benefits may I notice by using Skin-Support? Skin-Support is our exclusive skin nutrition formula that works to promote smooth, youthful looking skin, aiding in skin problems such as pigmentation, spots, dryness, fine lines and wrinkles. It is comprised of two key ingredients. One is a special form of marine collagen and elastin polypeptides called Collactive™ which is identical to the collagen and elastin matrix in the dermis, and the other is a special form of New Zealand grape seed extract. How much Collactive™ do I need to take to get the same results as the clinical trial? The amount of Collactive™ used in the clinical trial of Skin-Support was 2 grams (gms). Zupafood SKIN and ELITE include 2 gms in each serving and Skin-Support in comparison contains 1 gm. Therefore, you may choose to take one sachet of Zupafood daily or double the dose of Skin-Support. For even faster results, Zupafood and Skin-Support can be taken at the same time to deliver a total dosage of 3 gms per day. Is there a particular time of day that I should take Skin-Support in order to obtain the best possible results? As per the information provided by our supplier (including various clinical trials), there is no particular time of day that Collagen should be taken. As this is a naturally sourced, high-quality product it should be readily absorbed regardless of the time of day it is consumed. You may take all three capsules at one sitting, such as before bed or you may split the doses up throughout the day. They may be taken with or without food; whichever suits your lifestyle. We advise taking Skin-Support with a full glass of cold water. What is the difference between Skin-Support and Zupafood for SKIN? Skin-Support has been specially formulated for individuals wanting to focus solely on the skin and contains two potent ingredients; Collactive™ Marine Collagen and Oxi-fend Grape Seed Extract. This is in comparison to Zupafood for SKIN, which includes a range of other beneficial ingredients along with Collactive™ Marine Collagen. Zupafood also contains Green Tea Extract to deliver a natural boost to energy levels and an antioxidant-rich fruit extract blend. These added ingredients may offer support to other body systems, in addition to the skin. We have formulated Skin-Support for customers who prefer taking collagen in capsule form, rather than in a powder form, as it is in Zupafood for SKIN. It also contains a lower dose of Collactive™ and is therefore a more economical option. Can I double the dosage of Skin-Support? Yes absolutely. You can double or even triple the dose of Skin-Support safely without any side effects. This is great for individuals who really need that extra boost. Can Skin-Support be taken with other Xtend-Life supplements? Yes, all Xtend-Life products have been formulated to be taken in combination with each other and there are no issues with doing so. In fact, in many cases, taking them in combination can enhance benefits. We have put together some supplement protocols on our main product page which you can refer to. The word collagen is derived from the Greek word "kola" which means glue. Collagen gives skin its natural strength, elasticity and resilience. Marine collagen contains the amino acid proline which is a critical building block for the body's synthesis of collagen. What is the difference between Collagen Type 1 & 3 and Collagen Type 2? Scientific studies show that more than 90% of the collagen found in the body is Collagen Type 1 & 3. The protein composition consists of nineteen amino acids responsible for the growth and maintenance of the body with unusually high percentages of glycine, proline, and hydroxyproline, which are all found in the skin and muscle. Collagen Type 2 protein consists of eighteen amino acids, which amino acid profiles parallel the profile of the joint cartilage. Collagen Type 1 & 3 and Collagen Type 2 should not be combined due the types having different amino acid profiles. If taken together, the two proteins will bind and form a complete protein and the body will not recognize it as collagen. It is recommended that if you want to take both sources of collagen protein, take them at least an hour apart from one another. Is Skin-Support suitable for those with food allergies? Skin-Support is free from gluten, dairy, soy and peanuts. However, it does contain ingredients sourced from fish. What type of testing do you perform in your products? We carry out a variety of stringent testing, both on the individual ingredients and the finished products in our range, which are explained below. We perform microbiological, heavy metal, identification and potency testing on the ingredients we use in our products. Microbiological testing can include: total aerobic plate counts for bacteria, yeasts and moulds, total coliforms, E.coli, salmonella, pseudomonas and staph a., depending on the ingredient being tested. Heavy metals routinely tested for are arsenic, cadmium, mercury and lead. The full spectrum of heavy metals may also be assessed on a rotational basis. Identity testing ensures that every delivery of material received is true to label. Potency testing confirms that the active component is present and at the level desired. The finished products are also routinely tested for microbial and total heavy metal levels, as well as many in-process checks that ensure consistent, quality product. Our products are manufactured to GMP standards and are shipped worldwide. Because Xtend-Life own Natural Products (NZ) Ltd (who manufactures all Xtend-Life products), we have full control over the manufacturing and testing processes. We hold control samples of every batch of supplement produced. This means that we are always able to refer to each batch sample for further testing.